Philosopher: How am I being nihilistic? Youth: Think about it. Simply put, you deny human emotion. You say that emotions are nothing more than tools, that they’re just the means for achieving goals. But listen. If you deny emotion, you’re upholding a view that tries to deny our humanity, too. Because it’s our emotions, and the fact that we are swayed by all sorts of feelings, that make us human. If emotions are denied, humans will be nothing more than poor excuses for machines. If that isn’t nihilism, then what is? Philosopher: I am not denying that emotion exists. Everyone has emotions. That goes without saying. But if you are going to tell me that people are beings who can’t resist emotion, I’d argue against that. Adlerian psychology is a form of thought, a philosophy that is diametrically opposed to nihilism. We are not controlled by emotion. In this sense, while it shows that people are not controlled by emotion, additionally it shows that we are not controlled by the past. Youth: So people are not controlled either by emotion or the past? Philosopher: Okay, for example, suppose there is someone whose parents had divorced in his past. Isn’t this something objective, the same as the well water that is always sixty degrees? But then, does that divorce feel cold or does it feel warm? So this is a “now” thing, a subjective thing. Regardless of what may have happened in the past, it is the meaning that is attributed to it that determines the way someone’s present will be. Philosopher: Exactly. We can’t go back to the past in a time machine. We can’t turn back the hands of time. If you end up staying in etiology, you will be bound by the past and never be able to find happiness. Youth: That’s right! We can’t change the past, and that’s precisely why life is so hard. Philosopher: Life isn’t just hard. If the past determined everything and couldn’t be changed, we who are living today would no longer be able to take effective steps forward in our lives. What would happen as a result? We would end up with the kind of nihilism and pessimism that loses hope in the world and gives up on life. The Freudian etiology that is typified by the trauma argument is determinism in a different form, and it is the road to nihilism. Are you going to accept values like that? Youth: I don’t want to accept them, but the past is so powerful. Philosopher: Think of the possibilities. If one assumes that people are beings who can change, a set of values based on etiology becomes untenable, and one is compelled to take the position of teleology as a matter of course. Youth: So you are saying that one should always take the “people can change” premise? Philosopher: Of course. And please understand, it is Freudian etiology that denies our free will and treats humans like machines. Don’t let the past get you down. Here are 13 things to look forward to. 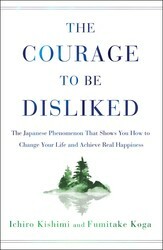 Excerpted from The Courage to Be Disliked by Ichiro Kishimi and Fumitake Koga. Copyright © 2018 by Simon & Schuster. Used by permission of the publisher. All rights reserved. The Courage to Be Disliked, already an enormous bestseller in Asia with more than 3.5 million copies sold, demonstrates how to unlock the power within yourself to be the person you truly want to be.Using the theories of Alfred Adler, one of the three giants of twentieth century psychology, The Courage to Be Disliked follows an illuminating conversation between a philosopher and a young man. The philosopher explains to his pupil how each of us is able to determine our own life, free from the shackles of past experiences, doubts, and the expectations of others. It’s a way of thinking that is deeply liberating, allowing us to develop the courage to change, and to ignore the limitations that we and other people have placed on us. The result is a book that is both highly accessible and profound in its importance. Millions have already read and benefitted from its wisdom. This truly life-changing book will help you declutter your mind of harmful thoughts and attitudes, helping you to make a lasting change, achieve real happiness, and find success.